Another use for corrugated cardboard is to make a beading tray. When I was a young woman I knew an old lady, a Tigua Indian, who used to string various seeds and varicolored corn to make necklaces. She used the grooves in corrugated cardboard to line up the colors in the order she wanted them before stringing them with her needle; some on leather strips, others on cords. I still have a couple of her necklaces, and the colors are bright as ever. I wonder what she did to make them keep their color, or if they just dried that way naturally. I take a medication once a week, and each time I do, I punch out a little white cardboard oval when I remove the pill. These ovals work in all kinds of ways, depending on how they are painted. I have used them as wall plaques, etc. Painted green or brown they serve as a base for making removable flower arrangements or wall swags. Left white, they have served as a base to glue onto for wedding flower arrangements as well. 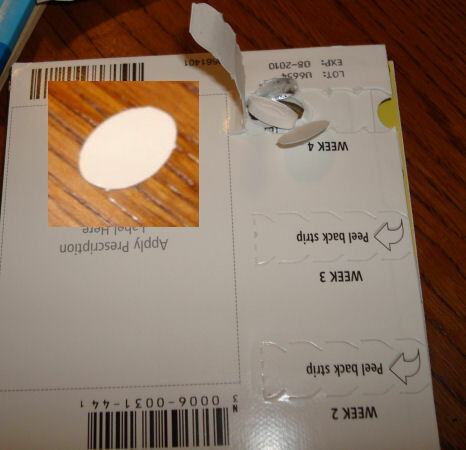 Any excess card showing behind the arrangement can be cut away. They also work as tabletops in quarter inch scale. Cut in half, they can serve as shelves, gluing one or more together for added thickness, as necessary, before painting. You do save old greeting and holiday cards, don't you? Because I was saving too much of everything, I finally had to set a limit of special cards for my scrapbooking and gave myself permission to cut up the others. I have already been cutting through cards in my stash for years (take a deep breath each time I do) and have found everything from marble to stone to metal to whatever. Sometimes there is an overlay of foil or other texture that is thin enough for quarter inch scale. Depending on the thickness of the card, cutting along the fold can give everything from tiny greeting cards to books. I used my tiniest hole punch to cut through one layer on a gold card and when I cut them apart had stand up picture frames with an opening in which to glue a tiny photo. Also, the tiniest figures look pretty good when cut out, too, especially if you put a bit of gloss sealer on top for dimension. I use a fine tip marker in a matching color to conceal any white edges. I have used those figures in creches, as well as figurines, etc., in bookshelves. One year I found duplicates of some cards that had the right scale snowmen, angels and wise men (not together lol) and made ornament scenes in those clear snap-together balls. Everybody tells me about getting them out to hang on the tree each year and remembering when I made them. But do I have one for myself? No! Nowadays I know better; I either make one to keep or make sure I have pictures, or both. One year my daughter gave me a lovely Hallmark Mother's Day card that had several rows of the daintiest laser paper lace down the side, each row a different pattern. I immediately could see mini uses for all that lace, but hated to mess up the pretty card. She said, "Mama, you can have my Mother's Day thoughts in all kinds of pretty projects. Go ahead; use the lace." So, after displaying that absolutely gorgeous card throughout the summer, I finally decided I would use it and cut away the strips of lace. It has been used judiciously as doilies in Miss Minnie's Hattery Flattery shop, and cutwork linens on Mother's Valentine's Day teacart, and doilies and tablecloths and window valances and all kinds of other ways in quarter scale. I even painted over a part of it for "carved" trim on a quarter scale headboard. I still have more paper lace waiting for just the right project. I have not seen another card like that particular one, although I have been searching ever since. Nowadays, I spend as much time looking at greeting cards for what they are made of and how I can use them, as much as for what they say.